For more than three decades, the women's movement and its scholars have exhaustively studied women's complex history, roles, and struggles. 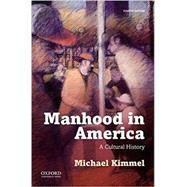 In Manhood in America: A Cultural History, Fourth Edition, author Michael Kimmel argues that it is time for men to rediscover their own evolution. Drawing on a myriad of sources, he demonstrates that American men have been eternally frustrated by their efforts to keep up with constantly changing standards. Kimmel contends that men must follow the lead of the women's movement; it is only by mining their past for its best qualities and worst excesses that men will free themselves from the constraints of the masculine ideal. Michael Kimmel is Professor of Sociology at Stony Brook University, State University of New York. A leading researcher and writer on gender and men and masculinity, he is the author of numerous books and articles, including The Gendered Society, Sixth Edition (OUP, 2016), The Gendered Society Reader, Sixth Edition (with Amy Aronson, OUP, 2016), and Guyland: The Perilous World Where Boys Become Men (2009). Chapter 10: From Anxiety to Anger Since the 1990s: The "Self-Made Man" Becomes "Angry White Men"